Autumn on Maui is almost non-existent: the leaves don’t change colors, there’s no real temperature drop and we don’t turn back the clock. But none of that stopped Lahaina Grill from rolling out a great fall cocktail menu. Lahaina Grill offers an elegant experience when supping in Lahaina, but my favorite spot in their lovely dining room is definitely the bar. You can order from the menu there, but more importantly I get facetime with bartenders Annabehl Sinclair and Mary Swiger. Their bar has exotic and classic combinations and Sinclair’s knowledge of the distilled drinks she serves is nothing short of fascinating. 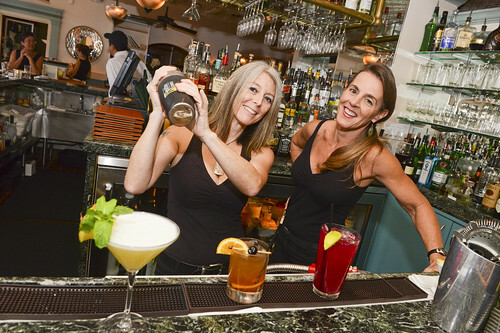 Their cocktails pair beautifully with their refined bistro cuisine menu. Veal meatballs, tequila shrimp, line caught fresh fish and wagyu ravioli are just a sampling of what they offer. 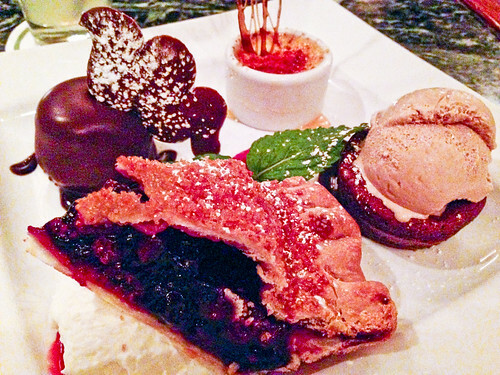 Desserts range from their signature triple berry pie to sunken chocolate cake. As you’d expect, they’re irresistible. During my most recent visit to Lahaina Grill, Sinclair described the process that goes into making bitters. It involves 30 days of straining and turning oranges, peels, base alcohol and spices. That kind of drink preparation doesn’t appeal to me, but tasting her drinks does. 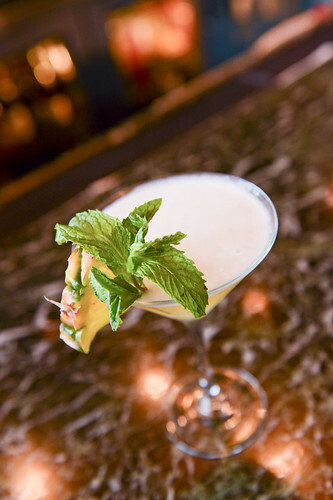 Her dedication to crafting a beverage is best tasted at the bar at Lahaina Grill. MAUITIME: Describe Lahaina Grill’s bar in one sentence. ANNABEHL SINCLAIR: Quality service, handcrafted cocktails and friendly conversation in a refined atmosphere. MT: Picture yourself sitting at your bar. What are you ordering? 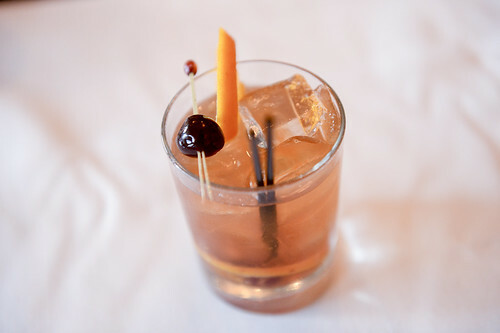 AS: Bulleit Old Fashioned with Amarena cherries and a big twist of orange. MT: Brown liquors are becoming more in vogue. What’s your best selling brown? Most exotic? AS: Bulleit bourbon–probably because it’s my favorite . Ron Zacapa aged rum is the most exotic. It’s dark and delicious and almost tastes like a bourbon. MT: Clear is still dear to many. What kind of clear cocktails are popular at your bar? AS: The Vesper, a James Bond martini. It’s Hendricks gin, Titos vodka and Lillet blanc. MT: You have a customer that isn’t sure what to order. 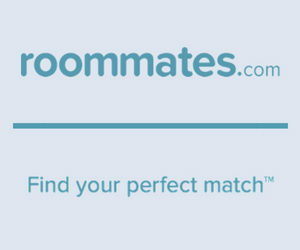 What do you suggest? AS: Our most popular cocktails–the Pearfection is Grey Goose pear vodka and apple pucker with prickly pear purée or the Pau Hana with Pau vodka, pineapple juice, mint, lime and cinnamon syrup. MT: We like Happy Hour. What’s good at yours? AS: We don’t have a Happy Hour, but we will make you happy. MT: What local liquors and brews are you carrying? AS: Maui Brewing Company beers, Pau Vodka, Hawaiian Vodka, Hawaiian Moonshine. MT: What local ingredients are you psyched on? AS: I’m obsessed with Hawaiian Moonshine. Strong and smooth flavor that pairs well with lavender honey and lemon juice–the Bee Sting. MT: Give us one delicious and simple drink recipe that you approve of. AS: The Pear and Ginger Sidecar: 1 1/4 oz J Pear brandy, 3/4 oz Canton Ginger Liqueur, 1/2 oz lemon juice. Shake with ice and strain into a demarera sugar-rimmed martini glass. Garnish with lemon.